A new report from the U.S. Food and Drug Administration links consumption of soybean oil to a reduced risk of coronary heart disease. Iowa Soybean Association president Rolland Schnell says it’s great news for the state’s soybean growers — and for consumers. “Hopefully, it’s going to put to rest some of the naysayers who like to paint soybean oil as a bad food ingredient,” Schnell says. 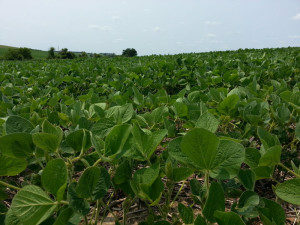 “It’s not and there’s all kinds of research to back up that it is beneficial, looking at it from a health standpoint.” Schnell says the cooking oil market is important for soybean farmers and the new report will enable manufacturers of soybean oil to tell consumers about the heart-healthy benefits. “It’s very positive and hopefully, the general public will take this report by the FDA to heart and realize its a valuable product for their health,” Schnell says, “and the volume of (sales) will continue to increase.” Schnell says sometimes soybean oil gets a negative rap, but this move by the FDA may change that. The FDA report recognizes the ability of soybean oil to provide a superior omega-three fatty acid profile while also lowering “bad cholesterol” levels.